I am not a Me Made May type of person. I wear hand-made clothes most days but it’s not something I need to advertise on Instagram. Friends know I make clothes and sometimes take an interest but I don’t, as a rule, draw attention to it. Making a pledge is something I would find rather embarrassing – like committing to give up the evil alcohol, or publically going on a diet. I have no aversion to off the peg, ready to wear clothing. In fact I love buying ready-made – you can try it on, it gives instant gratification, and it is often less expensive than making your own. Last week I bought a pink linen blouse and was grateful that i didn’t have to do all those buttonholes and buttons. Lots of pluses there, then. I don’t think shops are bad in and of themselves . I know a lot of people feel that sweat-shops and shops are somehow the same thing, but how do you think fabric is produced? Not by a group of well-fed hand-loom weavers, dyed in natural beetroot and transported to the market on a tandem. There are lots of items that I can’t be bothered to make – T-shirts, bras and jeans for example. I am not such an extraordinary shape that I cannot buy perfectly good ones in the shops. I enjoy wearing RTW items with clothes I have made myself. For me a head to toe “me made” outfit is contrived and a little bit goody-goody – like recycling everything, and always buying organic. I am afraid I am so superficial that style trumps rules every time. I love the juxtaposition of a tailored skirt and a Topshop T, or Levis and a handmade linen shirt, a nice hand painted silk dress with a cashmere cardigan. Do you enjoy seeing everyone’s outfits on a daily basis? I find it a bit boring – like looking at pictures of what someone else cooked or ate for dinner. Taking endless photographs of food has become an obsession, so why not picture, after picture, of what you wore today? Here I am today. I just got in from work. 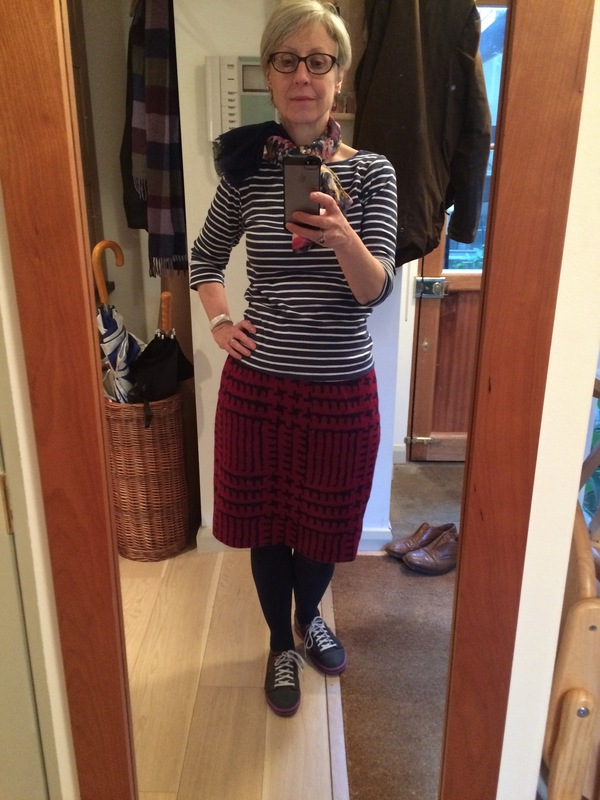 I am wearing a SWAP skirt with an indeterminate T-shirt (I always cut out the labels – do you?) and a scarf from John Lewis. It’s a “selfie”. Or is it just a bit silly? Actually I think Me Made May is more a “thing” for young women. If you are fairly new to dressmaking, knitting or baking perhaps pure excitement means you must share your work with the world so that lots of affirming comments (lovely colour!!! Gorge!!!! Amazeballs! Awesome!! etc….) accumulate on your Facebook page. I am a hypocrite of course – because a blog is like that too. Those skinny girls, with their long legs and hair, would look great in a plastic bag. But give me a handmade dress and cute shoes instead of skinny jeans and a black jumper any day. So I am not knocking the concept per se – I just don’t think it is for me. I did it one year but like you most of my clothes are home-made and so there wasn’t really a challenge at all. What was challenging was taking photos everyday and uploading them! I make a lot of my clothes, and like you, wear a mix of ready to wear with ‘me made’. But I’m not keen on photographing these outfits and uploading to social media on a daily basis. I think MMM is more of a personal challenge than a need for public appreciation. This is a great motivation for some sewists and it gives a sense of community. I do like the idea although not participating. You’re right about fabrics: they are not all produced in the best conditions, but still, I see many good reasons to sew your own clothes. Above all, you tend to buy less (it is so easy to buy more than needed in RTW, because it’s cheap and instant rewarding). Sewing gives you a better understanding of the time and effort behind every clothes. And it’s a good thing to know that what you wear has not been made by kids or someone litteraly chained to a sewing machine. Plus there are many selfish reasons: better fit, creativity, pride, etc. hi – As far as the bad conditions in the sewing industry, they do need to be brought to people’s awareness. Still, there is the question of what is better – working in the only job available with really bad conditions or having your family starve. Hard choice! I do Love your outfit here. I think MMM is more for new sewers that are just figuring out their preferences, or for anyone else that has the patience for daily photos – LOL! For me, I love seeing how your skirt, top, dress, jacket turned out. You have taken us on a wonderful journey and the reward is seeing it all together. I agree the daily selfie might be a generational thing but you did very well. I also agree, mix it up , hand sewn and RTW, it’s a-okay! I still love your style and thoughts so keep them coming! I agree. I have thought about doing me made may, but would bore myself stiff, let alone anyone else! I also agree with your comment about fabrics. Also sweatshops in some countries, India for example, employ women. While conditions may be awful, this is still the way out and up for most women – and over time, wages rise, and conditions change. So there is good and bad in all things. Nothing is simplistic. Agree with all your comments. The small thing about labels, I always unpick mine so that I don’t have the stitching line on the outside and cut out the washing instructions on the side. Otherwise chances are that I will be happily walking along with my label sticking out! I also always cut out the thin ribbon hanger loops that appear on everything RTW these days, for the very same reason. I am with you on that one too Sheree. Also I find them itchy and irritating. All my family does this – Mum, brother, kids. And washing instructions are funny. I just wash everything except coats and heavy jackets – using cold for delicates – and have never had any problems. I think the intended point of MMM is to challenge yourself, and discover perhaps something about yourself or your wardrobe, although I know not everyone does it for that purpose ^_^ I’m participating for the first time this year, but am much more private about it; i have not posted a single daily outfit on social media – it’s bad enough having to take pics for my blog posts, there’s no WAY i’d do it every day! LOL. That said, I am taking notes and it’s made me think about a few things more consciously. And yeah, RTW t-shirts every single day LOL. Where is the difference: SWAP or MMM? Both are a pledge or a contest, a sticking to some rule. As long as it keeps people motivated and happy, why should one question it. And everybody needs a bit of positive attention and feedback from time to time otherwise no blogs would exist. I find it endearing to see people happy and proud about their “innocent” achievements. Love this post, K. You honesty is always refreshing. I have nothing against MMM, but haven’t been tempted given that it seems a bit tedious. I have lots of things to say about sweat shops but many of the key points have been made above and I can’t type worth beans on my BB (at the airport!). I like your blended outfit. I find it difficult to shop at times because I don’t find fabrics that thrill me in rtw. That said, I have realized that I am happy mixing it up and will buy things I have no interest in sewing or things that I truly like. Thinking about it I’m not sure I can be bothered to collate all the photos and put into a post! That’s an evening when I could be sewing. Also I don’t think what I’ve been wearing everyday is particularly interesting. I don’t wear new outfits everyday as I also like to minimise my washing basket. I think it’s a great thing for people new to sewing – if you make a lot of your clothes anyway it’s not much of a challenge. Having failed on the first day at my first MMM I’m inclined to agree Kate! I didn’t know I was supposed to IG, cos I don’t IG. I am now so aware that what I wear is not because I’ve sewn it, but because its appropriate. Can’t be stuffed taking pics of myself every day, as the youth would say “effort”! I like the concept of MMM because it is a personal challenge – I too, think its a bit like SWAP ;). I did the whole MMM thing, with photos, 5 years ago and found it very useful for myself, taking photos and making notes on what felt good/was practical/looked good in real life and the ability to compare outfits by photographs helped me to work out what was the best use of my sewing time. This year I have taken no photos, but I am thinking about my outfits – but I’ve found its not nearly as much fun nor as motivating without the extra effort of the photographs. I’m definitely not young, and I’ve been sewing my own clothes since I was 12, so I don’t fit the new category either. I agree though, that with so many participants it is not so interesting at the moment to read blogs, when what I like to read is more about sewing than styling. I also find holier-than-thou attitudes rather objectionable in any passionate enterprise, be it religion, greenism (which I think may be a religion 😉 ) or diet! so I skip those blogs.